Robert E. Gard, 2016, 128 pages. Review by Dudley Cocke. Robert E. Gard, with additional contributions by Maryo Gard Ewell, Robert L. Lynch, and Michael Winslaw. Edited by Maryo Gard Ewell with Clayton Lord and Elizabeth Sweeney. 2016, 128 pages, Americans for the Arts, Washington, D.C.
And, then, unexpectedly I discovered something about my dad. He would disappear sometimes in the night… One night I went in search of him, alarmed at his absence, and found him finally, sitting in the midst of a small, remaining patch of wild prairie grass. Once this plot was the long-ago burial ground of a wandering tribe of Indians who had a village on the east bank of the Neosho River. I remember sitting down with him in the grass while a kerosene lantern flared beside us. And he began to explain somewhat inarticulately why he was there, and why this place was important to him. I finally got the idea. About all the wild tall prairie grass was gone. I remember thinking, as I walked out of the tent into the autumn sunlight, that this was the only real theater the people in this place knew … and that such plays were evil and would kill any art that might grow here… As I stood thinking, the great Butternut Valley that was all around me turned golden in the afternoon light. I looked at the hills, and suddenly my spirit was filled and lifted with a clear knowledge. I knew that there must be plays of the people filled with the spirit of places, and my aimless activities assumed meaning. For the rest of his life, Gard would be, in his daughter’s words, “a front-lines worker” bent on creating the conditions for rural people to release their spiritual, intellectual, and emotional force in dramas of, by, and for them. He was not immune to, in his own words, “dramatic ecstasy.” On the front lines of populist theater, there are no specialists; Gard was by turns a producer, playwright, dramaturge, actor, director, poet, manager, teacher, and writer. Today rural America faces unprecedented challenges. Eighty-five percent of the poorest counties in the United States are rural, and rural people, who comprise 20 percent of our population, lead the nation in per capita rates of suicide, drug addiction, and incarceration. Rural young men and women serve, are wounded, and die disproportionately in the armed forces. In 2011, less than 5 percent of all private foundation grants supported rural nonprofit organizations, including rural health care and higher education. Data indicate that less than 1 percent of foundation arts money reaches rural artists and their organizations. One wants Gard to still be part of the rural theater scene, joining his voice with those arguing for fairness. To Change the Face and Heart of America allows him to be. Gard’s last public presentation was at his alma mater, Cornell University, on October 10, 1992. The occasion was a national grassroots arts symposium that brought together one hundred arts practitioners, scholars, and interested grassroots observers whose work spanned decades from the 1930s to the present. Gard delivered one of the symposium’s five keynote talks.1 Each speaker presented a historical perspective on grassroots theater: Native American, African American, Hispanic/Latino, European American, and the 1935 to 1939 Federal Theatre Project. It became clear from the five historical perspectives that the central public policy issue had been, and remained, how to level the playing field so that all US cultures would have an equal chance to express themselves, to develop, and to cross-pollinate. Despite this shared aspiration (and a common adversary in those bent on perpetuating the reductive history the nation had been telling itself since 1776), the groups had never come together in solidarity. Instead, over the decades, each typically fought alone for equity, mimicking established historical patterns of segregation. The Federal Theatre Project was an exception, as Lorraine Brown’s presentation made clear, for the project created a national framework that enabled theater artists and audiences to cross lines of race, class, religion, and geography. According to the project’s meticulous audience surveys, in its first two years, 65 percent of its audience of more than twenty million people — rural and urban — were seeing a live play for the first time. This was too much for the elites in power. With the help of the FBI and Justice Department, congressional committees investigated; the Federal Theatre Project was closed by an act of Congress at midnight on June 30, 1939. In the following decades, a dwindling number of theater artists making plays of, by, and for the majority of Americans would be mostly left to their own devices. Gard’s symposium talk is one of the most inspiring that I have heard.2 Edward Kamark, whom Gard had mentored and who helped us plan the symposium, died shortly before the event. Gard himself was in the last stages of his cancer. His humility, sense of humor, considered way with words, and dedication all came across in that last public presentation, as they do for us now in To Change the Face and Heart of America. It is here that we meet a person of the theater who had a populist conviction born of a native vision. Dudley Cocke is the artistic director of Roadside Theater, a part of Appalshop, in Whitesburg, Kentucky. From 2002 to 2007, he served on the GIA board; he is currently a member of the Native Arts and Cultures Foundation Board. Dudley Cocke, Harry Newman, and Janet Salmons-Rue, eds., From the Ground Up, Grassroots Theater in Historical and Contemporary Perspective (Ithaca, NY: Community Based Arts Project, Cornell University 1993); https://roadside.org.https://roadside.org/asset/book-ground-grassroots-theater-historical-contemporary-perspective. “Video: Robert Gard’s Last Speech (1992).” Roadside Theater, https://roadside.org.https://roadside.org/asset/video-robert-gards-last-speech-1992. Dudley Cocke. 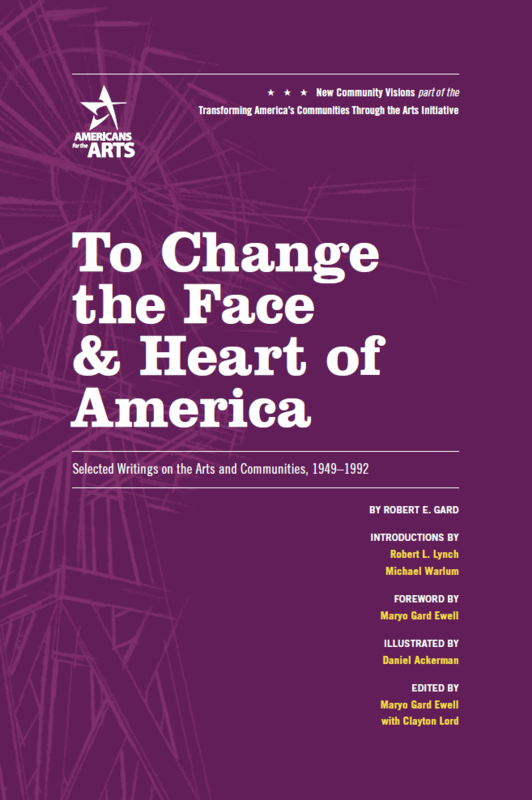 “Review: To Change the Face and Heart of America Selected Writings on the Arts and Communities, 1949–1992.” https://roadside.org. September 6, 2016. https://roadside.org/asset/review-change-face-and-heart-america-selected-writings-arts-and-communities-1949%E2%80%931992.